A shout out to Critique Circle – Writers this is a must see! Greetings! I hope you are having a lovely Sunday morning! Here in Long Island, NY the sun is shining, I’ve got a fresh cup of coffee and it looks like it’s going to be a great day! My first book, Silver Icon has been on sale for about a week now at both Amazon and Smashwords and I am so excited! I want to share some information to fellow writers about an awesome tool and web site that can help you with your goals to publish your own work. No, it’s not a publishing company, or any gimmick or trick. Also it’s not a magic wand! What it is, however is a great place on the web to meet fellow authors and writers, both published and unpublished, and exchange critiques on each other’s work. I am talking about www.critiquecircle.com! While I believe there is no substitution for professional editing, Critique Circle will come pretty damn close. And for the indie author on a tight budget, the price is right! Critique Circle’s membership is free! The site is a place where writers can post their work and other writers will critique your submissions. You can write critiques for other authors and form crit buddy relationships with many talented people. There is a “donation” method to become a premium member, but all of the main features of submitting and critiquing are available to all members. The premium membership, which is really a donation to keep the site running, gives you a few extra added perks, but is not required to get extreme value out of the site in regard to your work. 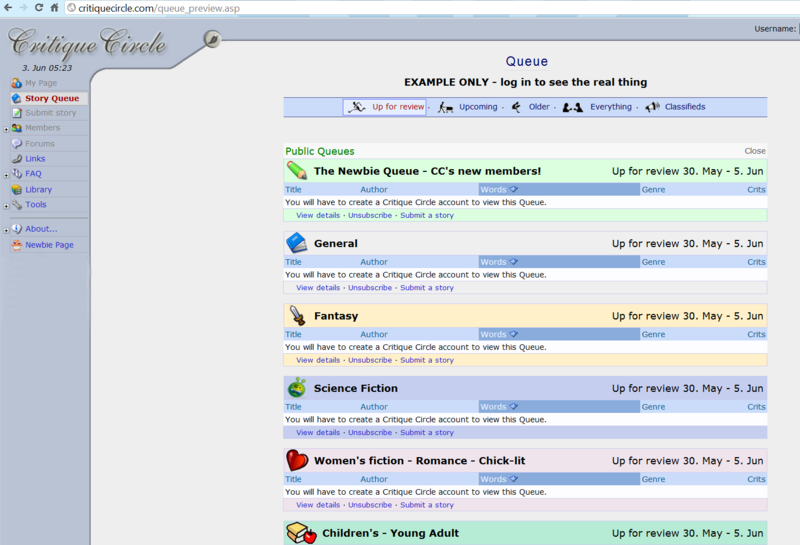 Many other useful features are available on Critique Circle. The site has a novel system, so you can chain your submissions together and crit buddies can follow your novel from start to finish. Authors can add a synopsis for their novel and for each chapter, content advisories for adult or mature stories, outlines for settings, plot and character sketches. The site also has a forum and message system so you can socialize with your fellow writers and crit partners. The credit system is nothing to worry about. I quickly became immersed in several of other author’s works, and in just reading, writing critiques and offering grammar or spelling suggestions, I very quickly grew a nice credit balance, enough to submit many chapters and stories. Since I started using the site, I’ve not ever run out of credits for submissions. I think I am actually critiquing more than I am submitting. I believe the main reason for this is because I am learning so much about writing, prose and style from the stories I read and the critique’s I have given other authors. This exchange from author to author is sharpening my writing skills as well as those of my crit buddies. The forums provide a lot of value too. For example, you can tie your story submissions to a personal forum thread–focused on that story so all your crit partners can collaborate with you and each other. In summary; if you are an author on a budget, don’t have access to an editor, or just want to bounce your chapters, stories or other writing pieces off on other people to receive feedback and edit suggestions, Critique Circle’s an awesome web site to do all that! I highly recommend the site to indie authors and would absolutely welcome new critique partners! For the official “What is Critique Circle About Page,” click here. Author NickPosted on June 3, 2012 June 3, 2012 Categories For WritersTags author, authors, beta readers, beta reads, crit, crit partner, critique, critique partner, ebook, editing, editor, editors, how-to, indie publishing, indie writers, tools for writers, tools for writing, writer, writers, Writing11 Comments on A shout out to Critique Circle – Writers this is a must see!